The following is a guest post by Br. Sharif Randhawa, co-author of the illuminating book, “Divine Speech” which was written alongside Ustadh Nouman Ali Khan. Br. Sharif also runs a wonderfully informative blog called Quranic Musings which I highly recommend! Contention 1: Rogers claims that the wording in the Quran of qul huwa ’llāhu aḥadun (“Say: He is Allah, one,” or alternatively “Say: He, Allah, is one”) is grammatically incorrect, because aḥadun means not “one” but “one of”; the text, according to him, should actually say qul huwa ’llāhu aḥadu. Answer: Rogers’ claim is exactly the opposite of what Arabic grammar entails. In a genitive construct, which is the form that expresses the grammatical formula “X of Y,” the X (or muḍāf) that is followed by the genitive Y (or muḍāf ‘ilayhi) precisely cannot carry tanwīn (the indefinite -n ending). 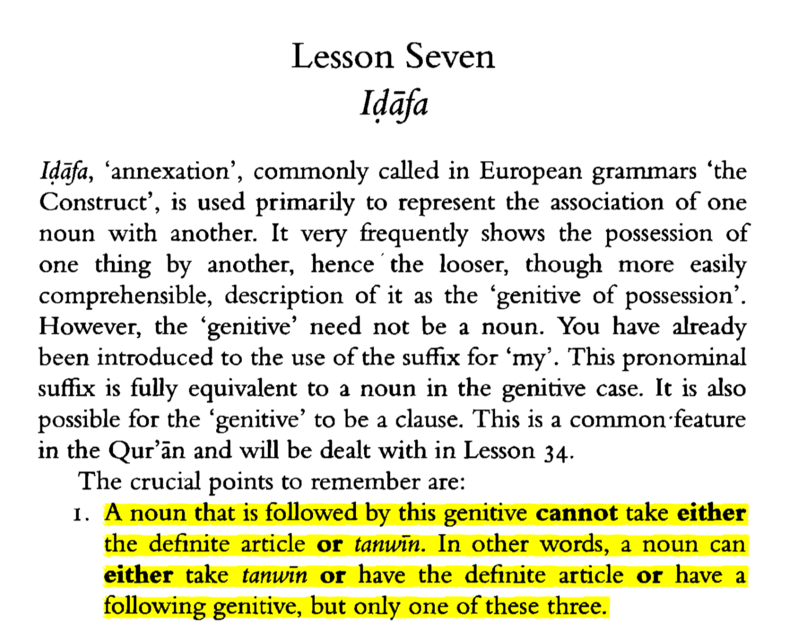 This is literally one of the first rules of a genitive construct in Arabic (see the excerpt from p. 44 from Alan Jones’ Arabic Through the Qur’ān, below). Contention 2: Rogers then claims that Muslims mis-recite the verse to avoid this alleged error, as Muslims most frequently recite the verse as qul huwa ’llāhu aḥad, without the inflected -(u)n ending. Answer: The claim that this is a mispronunciation is, again, false according to the most basic conventions of Arabic. This is because in Arabic speech, when one pauses at the end of a sentence that terminates with a short vowel ending, he or she normally drops the short vowel ending, including the tanwīn if there is one. Any Arabic speaker can confirm that for you. Does the translational history of a scripture matter? Most people don’t often consider this question, but it is very consequential with emphasis being on the transmission and understanding of scripture. While most people would consider translations to be a tool and aid for understanding scripture, the impact of a translation is often ignored. In this article, I wanted to point out some of the benefits and problems that the Qur’an and New Testament would face on this topic. Indeed, We have sent it down as an Arabic Qur’an that you might understand. – Qur’an 12:2. We need to consider that when God reveals scripture, that He has chosen a language that would best suit His message, and that when He has chosen a message to send in a specific language, that language and its language devices need to be studied to understand all of scripture. Not all languages are equal, there are language devices that exist in one language that may not exist in another, and so to translate between these languages would raise issues. For example, let’s say you’re trying to translate a metaphor from one language to another. It’s raining cats and dogs. For an English speaker they would know that this refers to heavy rainfall, but if we translate it word for word, literally from English into Spanish, would a Spanish speaker grasp the meaning intended by the phrase? If we translate it contextually to say that it means rainfall (excluding the mention of cats and dogs), is this faithfully representing the text as it was written? Confusion can occur for example, if a Spanish reader in looking at the Spanish text sees rainfall, but when comparing with the English, they see cats and dogs. They may assume the translator made an error and omitted words thus leading to confusion. Translators often have to walk a very fine line, if they translate a phrase word for word it can lead to the loss of intended meaning (context) and if they translate contextually they can be accused of not faithfully representing the original words as they were written. Therefore, the language of scripture matters. Throughout Islam’s history, the Qur’an as revealed in the Arabic language has always been regarded as scripture. Translations have however been understood as interpretations of scripture and not necessarily scripture in and of itself. Translators by profession are interpreters, it’s their very job title. This distinction is very important because the Islamic tradition has always definitively defined what scripture is and what it isn’t. The Islamic tradition has always emphasized that Muslims should learn how to read the Arabic Qur’an, how to recite the Arabic Qur’an (tajweed), it is fard al ‘ayn (personally obligatory) to learn the Arabic language such that we can understand the Qur’an and the Prophetic Sunnah. I previously spoke about language devices existing in one language and not in another, an example of this is the dual noun in the Arabic language. In the English language we know of singular and plural nouns, the Arabic language has an intermediate category of nouns, dual nouns, this is not found in the English language. Muslims are taught to perform salaah (prayer) in the Arabic language and to perform the remembrance of God in the Arabic language (dhikr). Suffice it to say, one of the reasons the Qur’an has been preserved, not just merely the text itself but also the recitation and the meaning is because of the commands of God to use the Arabic language when it comes to scripture and worship, it preserves the sources of Islam as they were received by the Prophet (peace be upon him) and his companions (may God be pleased with them all). This is not the case with the New Testament. While the earliest manuscripts of the New Testament are written in Koine Greek, for 1000 years the New Testament was only considered to be scripture in the Latin language. This would mean that for 1000 years (until the Erasmian text) Christians were not reading scripture in its original language with its original language devices but that they were reading an interpretation of the New Testament altogether. Even when the Greek reconstructions of the New Testament came into favour, Christians still relied primarily on translations. This presents many problems for the transmission and preservation of the New Testament itself. We need to ask ourselves, why would God reveal a scripture in Koine Greek, only for it to be abandoned and a translation used in its place? The fact remains that the go-to language for the New Testament, from its inception has statistically been a language other than the Koine Greek it originated in, whether that be Latin or today’s English. The problem is compounded by the fact that the Christian tradition itself has no internal mechanisms for which Christians need to rely on the language the scripture was allegedly revealed in. Consider that translations are not merely considered translations but equal with the original Koine Greek in and of itself, also consider that there is no onus on a Christian to have to learn to read Koine Greek, to have to study Koine Greek, or to have to use it in any religious practises. This is in stark contrast with Islam, God not only revealed an Arabic scripture but also placed internal mechanisms (religious practises) that encouraged and ensured that the scripture as it was revealed would be preserved and studied, as it was meant to be understood. The same cannot be said for the New Testament and so it brings into question the validity of the New Testament as scripture to begin with. And so we return to our original question. If God revealed scripture in a specific language, then surely there was a purpose for that. While we can account for this purpose in Islam, we cannot account for this purpose in Christianity. Yes it is true that scripture is meant to be understood, so there is no inherent harm in translating scripture into a language so people may understand it, but there is harm in abandoning the original language of scripture altogether. At a very young age Muslims begin the practise of teaching the Arabic language but we do not find this in Christianity when it comes to Koine Greek, this has led to a significant divide in the way that Muslims and Christians understand scripture. Should you ask a Christian if it is important to learn Koine Greek, they’d tell you no. Yet when we look at their commentaries of the New Testament, we find endless translation notes and lexical explanations. If there is no need to learn the language of the New Testament, then why do these translation notes and lexical explanations exist? Seminary graduates have to learn Koine Greek to understand scripture, to be able to exegete scripture, so while the lay Christian is told that they don’t need to learn the language, their scholars and preachers who attend seminaries realise that they do have to learn Koine Greek. This cognitive dissonance when it comes to the attitudes that Christians have towards the New Testament harms the religion of Christianity. A person who relies solely on the understanding of scripture through a translation will either end up with a wrong understanding or a wrong impression of what scripture teaches. Often times we find preachers using word studies to prove doctrines based on English translations! Clearly there is a problem inherent to the Christian understanding and definition of scripture. To demonstrate the validity of this point, let’s take for example Dr. Michael Licona’s new book, “Why Are There Differences in the Gospels? : What We Can Learn from Ancient Biography”. After specifically studying Graeco-Roman bios (biographical) literature for 7-9 years, Dr. Licona, a well-known Christian scholar and apologist, advertises his book with the claim that he has discovered a literary device used by ancient authors in biographies that explains the contradictions in the stories about the life of Jesus Christ in the New Testament. This literary device he calls, “literary spotlighting”, a device not ever named by anyone before in the some 2000 years that Graeco-Roman literature has been studied by scholars worldwide. Consider the troubling consequences of such a claim. That for 2000 years, scholars who have dedicated not merely 7-9 years of study on classical ancient works but their entire lives did not know of an important and core literary device used extensively by Graeco-Roman authors. Even worse off, is the claim that this literary device was used in scripture and not known by anyone else. How is such an absurd claim possible? It’s only possible when the language the scripture was allegedly revealed in, was ignored, discarded and abandoned. Literary devices directly affect the way we understand a language, Dr. Licona is effectively saying that for some 2000 years there has been a language device in use in scripture, that had not been identified previously. This fundamentally affects the way we understand the New Testament and at the very least demonstrates the importance of preserving a scripture in the language it was said to have been revealed in. In the end, when Christians preach to Muslims and those of other faiths, they boldly claim that all you need to be saved is to accept Jesus Christ as Lord and Saviour. It’s only when a new Christian (or newly practising) becomes devoted to Bible study, do they find themselves being told that they should probably find a better translation, or compare translations for a better understanding, or that they need to return to the Koine Greek rendition of a passage to wholly grasp its meaning. For some, they quickly realise that the requirements of understanding scripture go beyond reading a translation and that it’s more than just accepting Jesus Christ as Lord and Saviour. It’s a lot like being signed up for a cable subscription only to discover that there are hidden fees. We do not find this problem with Islam, and so we must ask once more, if God revealed a scripture in a specific language then surely that language and learning it must matter, right? What a headline. Those are words I never thought I’d one day have to write. I’ve been interacting with Dr. Tony Costa for some time, most people would know I recently debated him last year on the topic of, Was Jesus the Son of God or Only the Prophet of God? For sometime now I’ve been ill with a severe chronic illness, this is public knowledge and people generally know that I’m quite frail most of the time. As such, any mildly strenuous physical activity leads to hospital trips where I am given pain medication and observed for some time. Over the course of last night and this morning, I had the unfortunate experience of seeing Dr. Costa pretend to know the Arabic language. After having pointed out why he was wrong on the morphology of the term آله (Ilah), and that he was confusing it with a completely different word لت (Lat), while using three lexicons: Lane’s, Hans-Wehr and Lisan al Arab, and the Arabic Bible used by the Coptic Church: Smith & Van Dyke Arabic Bible, Dr. Costa decided he was correct despite all of these evidences proving him to be incorrect. To settle the matter, I simply asked Dr. Tony if he could kindly give me the morphology of the term آله. For anyone who has done more than one week of Arabic, you’d know how to derive the female from this root word. He was unable to do so, in fact, he outright refused to do so. Tony insisted that his finding the female of آله had nothing to do with using the root of the word. Does that sound incredulous? I’m not kidding. Apparently Tony studied sarf (morphology) to the point where he does not use the root of words to derive their sexes and numerical forms. Considering you need to use root words to derive any other form of the word, I’m not sure what planet he believed he was on. In trying to help him and to save him from further embarrassment, I simply indicated that he was trying to get the feminine of word A (آله) using the word B (لت). I gave him a simple explanation, it’s as if he was trying to get the plural of orange, which is oranges, by using the word range. Orange has nothing to do with range. Unfortunately, without showing his morphology, or how it was possible to get the form of one noun, using a completely different noun, Tony decided he was correct. Regrettable as it was for him, several people, including myself who were included in the exchange have knowledge of the Arabic language. This led to an endless fit of laughter lasting several hours. It’s akin to seeing a child get their ABCs wrong, and insisting they’re correct because their friends in kindergarten also recite their ABCs this way. So basic was his error, everyone knew that he was pretending to know the Arabic language. Yet he couldn’t get the female derivative of a noun. Knowing that he was pretending, we waited to see what his other replies would be. His last reply insisted that he was correct, no morphology, no explanation, nothing. To put it diplomatically, it was cringe-worthy. Due to laughing excessively, it led to me having a coughing fit, which triggered my other symptoms, thus landing me in the hospital. I’ve now been released and am back home and resting, Alhamdulillah. This is the first time that someone’s ignorance has actually, physically hurt me. Dr. Tony Costa pretending to know Arabic and failing at it, sent me to the hospital. Thank you Tony, thank you. If anyone would like to confirm that this story is true, one can ask Br. Yusuf Ismail, Br. Yusuf Bux, Br. Paul of Blogging Theology or Br. Yahya of The Facts About Islam. I’d like to announce that Ustadh Alie Ataie, whom I personally consider to be the most professional Muslim scholar on Christianity is having a 12 week course on the Gospels for free! This is an unmissable event, he speaks Arabic, Hebrew and Greek, he’s also graduated from a Christian Theological Seminary! 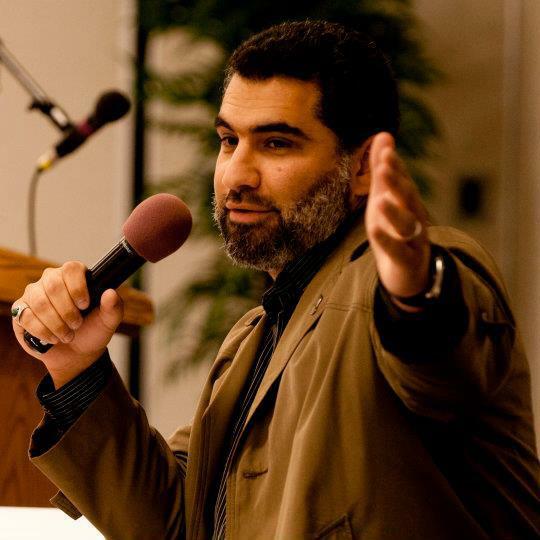 Ali Ataie is the President and Founder of Muslim Interfaith Council and has been involved in interfaith activities for over ten years. He earned his undergraduate degree in Accounting from Cal Poly State University in 2000, during which time he served as the President of the Muslim Students’ Association . He has been both a guest lecturer and guest instructor at several colleges and universities such as Cal Poly State , UC Davis , UC Berkeley, and Cal State East Bay . He studied various Islamic sciences under local Bay Area scholars and has dialogued and debated with several Christian scholars on a variety of topics ranging from the historicity of the resurrection of Christ (upon whom be peace) and the Prophethood of Muhammad (upon whom be peace and blessings). He is a graduate of the Badr Arabic Language Institute in Hadramawt, Yemen and studied at the prestigious Dar al-Mustafa under some of the most eminent scholars in the world. He holds a Masters’ Degree in Biblical Studies from the Graduate Theological Union in Berkeley, (the first Muslim seminarian in the 143 year history of the school to do so), and is working on a PhD in Islamic Biblical Hermeneutics. Click here to register for the free course! The person and essence of Jesus: only human, only divine, or both?